DeCoito, I. & Richardson, T. (2018). Teachers and Technology: Present Practice and Future Directions. 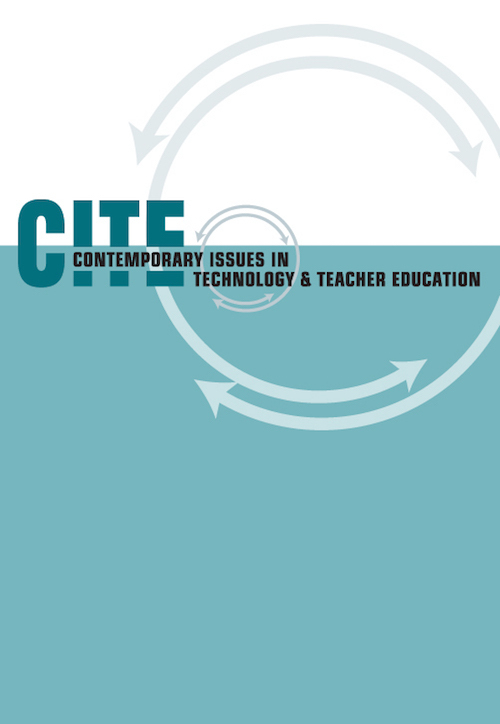 Contemporary Issues in Technology and Teacher Education, 18 (2), 362-378. Waynesville, NC USA: Society for Information Technology & Teacher Education. Retrieved April 20, 2019 from https://www.learntechlib.org/primary/p/180395/. Baturay, M.H., Gökçearslan, S., & Sahin, S. (2017). Associations among teachers' attitudes towards computer-assisted education and TPACK competencies. Informatics in Education, 16(1), 1-23. Buckenmeyer, J.A. (2010). Beyond computers in the classroom: Factors related to technology adoption to enhance teaching and learning. Contemporary Issues in Education Research, 3(4), 27-36. Creswell, J.W. (2014). Research design: Qualitative, quantitative and mixed methods approaches (4th ed.). Thousand Oaks, CA: Sage Publications Inc.
DeCoito, I., & Richardson, T. (2016). Focusing on integrated STEM concepts in a digital game. In M. Urban& D. Falvo, (Eds. ), Improving K-12 STEM education through technological integration (pp. 1-23). Hershey, PA: IGI Global. Hechter, R., & Vermette, L.A. (2014). Tech-savvy science education? Understanding teacher pedagogical practices for integrating technology in K-12 classrooms. Journal of Computers in Mathematics and Science Teaching, 33(1), 27-47. Iskander, T.E., Gore, P.A., Furse, C., & Bergerson, A. (2013). Gender differences in expressed interests in engineering-related fields ACT 30-year data analysis identified trends and suggested avenues to reverse trends. Journal of Career Assessment, 21(4), 599613. Kyriakides, A.O., Meletiou-mavrotheris, M., & Prodromou, T. (2016). Mobile technologies in the service of students' learning of mathematics: The example of game application A.L.E.X. In the context of a primary school in Cyprus. Mathematics Education Research Journal, 28(1), 53-78. Lin, S., Lin, C., & Lee, D. (2015). The relationship between elementary school teachers' technology readiness and intention to use social media platforms for classroom management. International Journal of Organizational Innovation, 8(1), 48-63. Mistler-Jackson, M., & Songer, N.B. (2000). Student motivation and internet technology: Are students empowered to learn science? Journal of Research in Science Teaching, 37(5), 459-479. Nordin, H., & Faekah, T.A.T. (2016). Validation of a technological pedagogical content knowledge instrument in a Malaysian secondary school context. Malaysian Journal of Learning and Instruction, 13(1), 1-24. Ritzhaupt, A.D., Dawson, K., & Cavanaugh, C. (2012). An investigation of factors influencing student use of technology in K-12 classrooms using path analysis. Journal of Educational Computing Research, 46(3), 229-254. Ruggiero, D., & Mong, C.J. (2015). The teacher technology integration experience: Practice and reflection in the classroom. Journal of Information Technology Education: Research, 14, 161-178. Saudelli, M.G., & Ciampa, K. (2016). Exploring the role of TPACK and teacher self-efficacy: An ethnographic case study of three iPad language arts classes. Technology, Pedagogy and Education, 25(2), 227-247. Shroff, R.H., & Vogel, D.R. (2009). Assessing the factors deemed to support individual student intrinsic motivation in technology supported online and face-to-face discussions. Journal of Information Technology Education, 8, 59-85. Stake, R. (2000). Case studies. In N.K. Denzin & Y.S. Lincoln (Eds. ), Handbook of qualitative research (pp. 435-454). Thousand Oaks CA: Sage Publications. Uluyol, Ç., & Sahin, S. (2016). Elementary school teachers' ICT use in the classroom and their motivators for using ICT. British Journal of Educational Technology, 47(1), 65-75. Voogt, J., Fisser, P., Pareja Roblin, N., Tondeur, J., & Van Braak, J. (2013). Technological pedagogical content knowledge– a review of the literature. Journal of Computer Assisted Learning, 29(2), 109-121. Wang, S., & Reeves, T.C. (2006). The effects of a web-based learning environment on student motivation in a high school earth science course. Educational Technology Research and Development, 54(6), 597-621. Ward, L., & Parr, J.M. (2010). Revisiting and reframing use: Implications for the integration of ICT. Computers& Education, 54(1), 113-122. Zimlich, S.L. (2015). Using technology in gifted and talented education classrooms: The teachers' perspective. Journal of Information Technology Education: Innovations in Practice, 14, 101-124. Is Second Life effective for pre-service teachers’ teaching practice?